Islam is the most common government-endorsed faith, with 27 countries (including most in the Middle East-North Africa region) officially enshrining Islam as their state religion. By comparison, just 13 countries (including nine European nations) designate Christianity or a particular Christian denomination as their state religion. But an additional 40 governments around the globe unofficially favor a particular religion, and in most cases the preferred faith is a branch of Christianity. Indeed, Christian churches receive preferential treatment in more countries – 28 – than any other unofficial but favored faith. In some cases, state religions have roles that are largely ceremonial. But often the distinction comes with tangible advantages in terms of legal or tax status, ownership of real estate or other property, and access to financial support from the state. In addition, countries with state-endorsed (or “established”) faiths tend to more severely regulate religious practice, including placing restrictions or bans on minority religious groups. In 10 countries, the state either tightly regulates all religious institutions or is actively hostile to religion in general. These countries include China, Cuba, North Korea, Vietnam and several former Soviet republics – places where government officials seek to control worship practices, public expressions of religion and political activity by religious groups. States with an official religion confer official status on a particular religion in their constitution or basic law. These states do not necessarily provide benefits to that religious group over others. But, in most cases, they do favor the state religion in some way. States with a preferred or favored religion have government policies or actions that clearly favor one (or in some cases, more than one) religion over others, typically with legal, financial or other kinds of practical benefits. These countries may or may not mention the favored religion in their constitution or laws; if they do, it is often as the country’s “traditional” or “historical” religion (but not as the official state religion). Some of these countries also call for freedom of religion in their constitutions – though, in practice, they do not treat all religions equally. States with no official or preferred religion seek to avoid giving tangible benefits to one religious group over others (although they may evenhandedly provide benefits to many religious groups). For example, the U.S. government gives tax exemptions to religious organizations under rules that apply equally to all denominations. Many countries in this category have constitutional language calling for freedom of religion, although that language alone is not enough to include a country in this group; coders must determine that these countries do not systematically favor one or more religions over others. 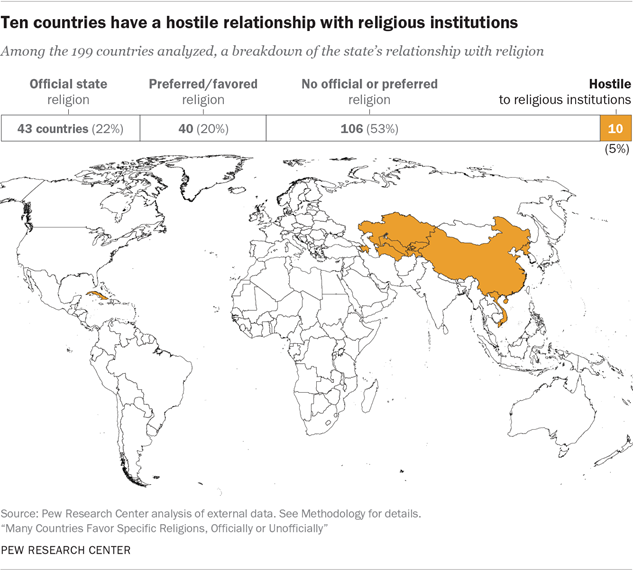 States with a hostile relationship toward religion exert a very high level of control over religious institutions in their countries or actively take a combative position toward religion in general. Some of these countries may have constitutions that proclaim freedom of religion, or leaders who describe themselves as adherents of a particular religion, such as Islam. Nonetheless, their governments seek to tightly restrict the legal status, funding, clergy and political activity of religious groups. This research is part of a broader effort to understand restrictions on religion around the world. For the past eight years, Pew Research Center has published annual reports analyzing the extent to which governments and societies around the world impinge on religious beliefs and practices. The studies are part of the Pew-Templeton Global Religious Futures project, which analyzes religious change and its impact on societies around the world. The project is jointly funded by The Pew Charitable Trusts and the John Templeton Foundation. The rest of this report looks in more detail at countries with official state religions or preferred religions, as well as those with no preferred religion and those that are highly restrictive or hostile toward religion. It also explores the implications of these categories. As of 2015, fully one-in-five countries around the world (22%) had declared a single state religion, typically enshrined in the constitution or basic law of the country. A slightly smaller share of countries (20%) have a preferred or favored religion. These are not official state religions, but may be listed in the constitution or laws as the country’s traditional, historical or cultural religion(s), and may receive benefits from the state that are not afforded to other religions. A slim majority of countries (53%) have no official or preferred religion as of 2015. Within their borders, these countries treat different religions (e.g., Christianity, Islam) more or less equally, and their governments generally have a neutral relationship with religion. 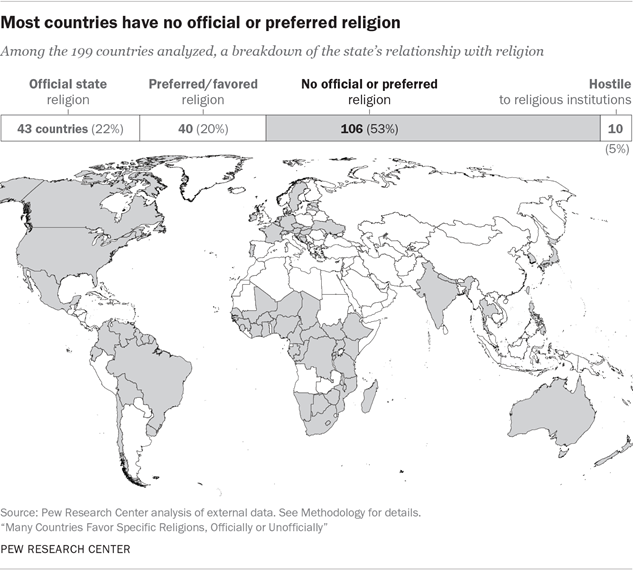 A small share of countries (5%) have no official state religion or preferred religion but nonetheless maintain a highly restrictive or hostile relationship with some or all major religious groups in the country, strictly regulating religious institutions and practices. These are Azerbaijan, China, Cuba, Kazakhstan, Kyrgyzstan, North Korea, Tajikistan, Turkmenistan, Uzbekistan and Vietnam. Several of the other countries in this category are former Soviet republics: Azerbaijan, Kazakhstan, Kyrgyzstan, Tajikistan, Turkmenistan and Uzbekistan. Before the dissolution of the Soviet Union in 1991, religion was tightly restricted by the state and sometimes harshly repressed. Since gaining independence, these predominantly Muslim countries have allowed nominal freedom of worship, and many of their leaders have publicly embraced Islam. Yet their governments have continued to monitor and control religious institutions, including mosques and Muslim clergy. Islam is the world’s most common official religion. Among the 43 countries with a state religion, 27 (63%) name Sunni Islam, Shia Islam or just Islam in general as their official faith. Most of the countries where Islam is the official religion (16 of 27, or 59%) are in the Middle East and North Africa. In addition, seven officially Islamic countries (26%) are in the Asia-Pacific region, including Bangladesh, Brunei and Malaysia. And there are four countries in sub-Saharan Africa where Islam is the state religion: Comoros, Djibouti, Mauritania and Somalia. No countries in Europe or the Americas have Islam as their official religion. Christianity is the second most common official religion around the world. Thirteen countries (30% of countries with an official religion) declare Christianity, in general, or a particular Christian denomination to be their official state religion. Nine of these countries are in Europe, including the United Kingdom, Denmark, Monaco and Iceland. Two countries in the Americas – Costa Rica and the Dominican Republic – and one in the Asia-Pacific region – Tuvalu – have Christianity as their official state religion. Only one country in sub-Saharan Africa is officially Christian: Zambia. Among the 40 countries that have a preferred or favored religion – but not an official state religion – most favor Christianity. Twenty-eight countries (70%) have Christianity as the preferred religion, mostly in Europe and the Americas. Five countries in sub-Saharan Africa and three in the Asia-Pacific region have Christianity as the favored religion. After Christianity, Buddhism is the next most commonly favored religion. All four countries with Buddhism as the favored religion – Burma (Myanmar), Laos, Mongolia and Sri Lanka – are in the Asia-Pacific region. Three countries – Sudan, Syria and Turkey – favor Islam but do not declare it as the state religion. 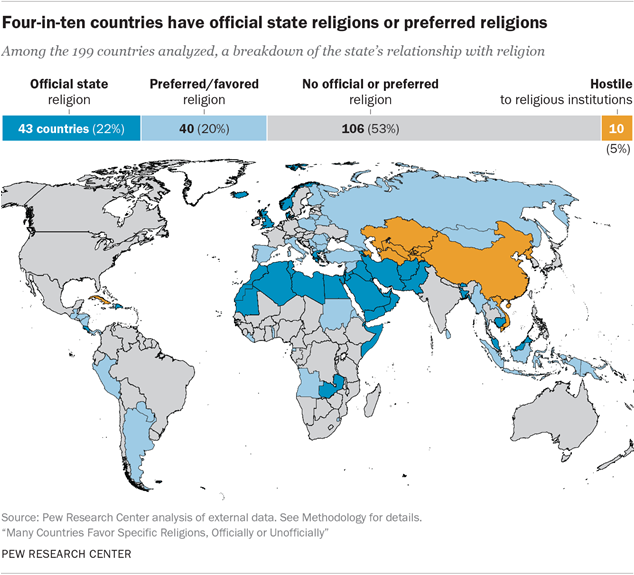 In some countries, multiple religions are favored to a similar extent by the state. Typically, the government describes these religions as “traditional” or part of the country’s historic culture. It may also provide these groups with legal or financial benefits, such as waiving the requirement to register as a religious group, providing funding or resources for religious education, or providing government subsidies. Five countries – Eritrea, Indonesia, Lithuania, Serbia and Togo – fit these criteria. By contrast, Russia recognizes multiple “traditional” religions, but favors Orthodox Christianity more than the others (see here for more information). 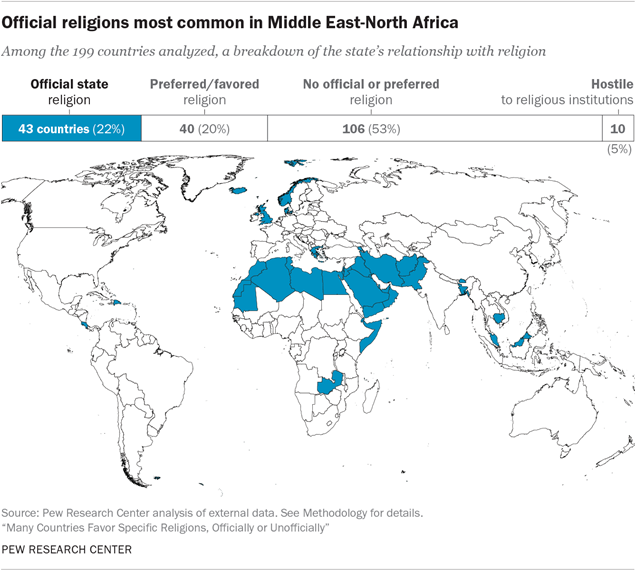 From a regional perspective, the Middle East-North Africa region has the highest share of countries with an official state religion as of 2015. Seventeen of the 20 countries that make up the region have a state religion – and in all of them except Israel, the state religion is Islam. Two others, Sudan and Syria, have a preferred or favored religion (in both cases, also Islam). Lebanon is the only country in the region without an official or favored religion, although key officials are elected or appointed based on religious affiliation (Sunni, Shiite, Maronite Catholic and other minority religious groups) under the terms of Lebanon’s 1943 National Pact, which is intended to distribute power among the country’s major religious sects. Nine countries in Europe (20%) have an official state religion as of 2015. These include Catholicism in the small states of Liechtenstein, Malta and Monaco; Lutheranism in Denmark, Iceland and Norway; Anglicanism in the United Kingdom; and Orthodox Christianity in Greece and Armenia.16 Altogether, Europe and the Middle East-North Africa region contain 42 countries with either official (26) or preferred (16) religions – together they make up roughly half of all the countries in the world in these categories combined. One country in the Americas, Cuba, has a heavily restrictive relationship with religion. But roughly seven-in-ten countries in the region (69%) have no official or favored religion. Eight countries in the Americas (23%) have a favored religion, while two – Costa Rica and the Dominican Republic – have Catholicism as the official state religion. In a few cases, a country’s official religion is primarily a legacy of its history and now involves few, if any, privileges conferred by the state. And a few other countries fall at the other end of the spectrum, making their official religion mandatory for all citizens. Much more frequently, however, states with official religions do not make the religion mandatory, but do give it more benefits than other religions, and those states typically regulate other religious groups in the country. More than half (53%) of the 43 countries with official religions meet these criteria. These countries still provide “freedom of religion” on some level – they allow worship by members of other religions, though they give the official religion more benefits or make benefits more readily available to it. In addition, among countries with official religions, three-in-ten (30%) give more benefits to the state religion while also creating an especially harsh environment for other religions (beyond basic regulation of those groups). In these countries, adherence to the official religion is not mandatory, but other religions are not given the same benefits and their activities are sometimes heavily restricted by the government. Most of these countries are in the Asia-Pacific and Middle East-North Africa regions. In a small minority of countries, the official religion is largely ceremonial or it receives some benefits along with its official status. Other religions in the country, however, may be given similar benefits. Among the 43 countries with official state religions, only three – all in Europe – meet these criteria: Liechtenstein, Malta and Monaco. There also are four states with an official religion – in each case, Islam – that make adhering to that religion mandatory for their citizens: Comoros, Maldives, Mauritania and Saudi Arabia. There also usually are financial benefits for official state religions. Among the 43 countries with an official religion, 98% provide funding or resources for educational programs, property or other religious activities. 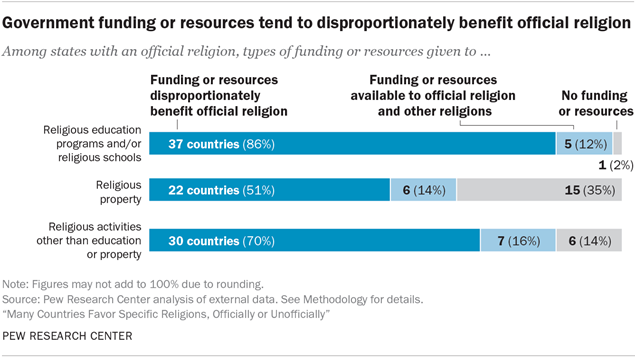 More than eight-in-ten countries (86%) provide funding or resources specifically for religious education programs or religious schools that disproportionately benefit the official religion. In Comoros, where the official state religion is Islam, the government funds an Islamic studies program, the Faculty of Arabic and Islamic Science, within the country’s only public university.27 Meanwhile, 12% of countries with an official religion provide this type of funding or resources for other religions as well. And only one country with an official religion – Tuvalu – provides no significant funding or resources for religious education programs or religious schools. Governments may also provide funding or resources for religious activities unrelated to education or property. These activities include – but are not necessarily limited to – providing media services, supporting worship or religious practices, or paying religious leaders’ wages. By definition, all countries with preferred or favored religions (but not official state religions) provide some practical benefits to those religions (see above). But when it comes to one of the most common kinds of benefits – states providing funding or resources to religious groups – there are wide variations in what governments provide and how they provide it. About a third of countries with preferred religions (28%) provide state funding or resources for religious education programs not only for the favored religion but also for other religious groups. And 15% do not provide significant funding or resources for any religious education programs. In Central and Eastern Europe, the relationship between church and state in a country is often reflected in public opinion on the topic. For example, people in countries with official or preferred religions are more likely to support government promotion of religious values and beliefs, as well as government funding of the dominant church; they also tend to believe religion is important to their sense of national belonging. Respondents in all 18 countries were asked whether they think their government should promote religious values and beliefs, or if religion should be kept separate from government policies. On balance, people in Central and Eastern European countries with no official or preferred religion are more likely to say religion should be kept separate from government policies (median of 68%) than are those who live in countries with an official or preferred religion (median of 50%). 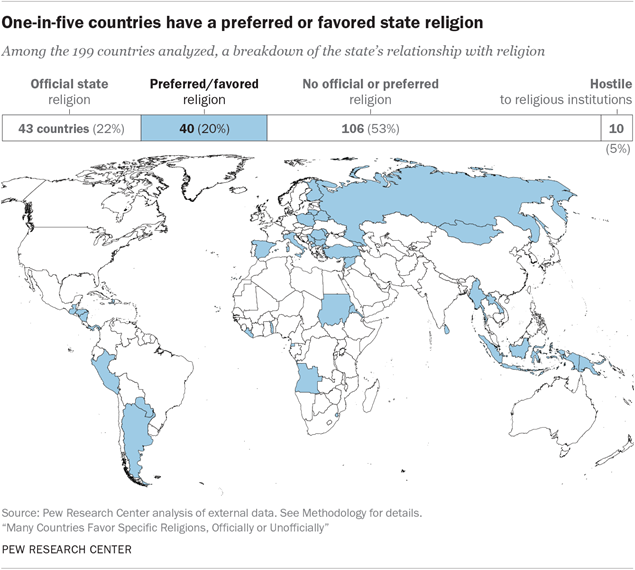 Among countries with official or preferred religions, Poland is an exception to this pattern, because of its strong support for separation of church and state (70%). Relations between the Catholic Church and Polish government are enshrined in a concordat that, among other things, grants the Catholic Church unique privileges in church-state discussions. Polish adults appear to recognize this level of influence – three-quarters (75%) say religious leaders have at least some influence in political matters. Many Poles, however, are uncomfortable with it; a majority (65%) believe religious leaders should not have this much political influence. Another survey question asked Central and Eastern Europeans about their attitudes toward government funding of churches. Across countries with an official or preferred religion, more people support governments giving financial support to the dominant church in the country (median of 53%) than in countries without an official or preferred religion (median of 39%).35 For example, in Armenia, a majority of respondents (62%) say the government should fund the Orthodox Church (the official state religion). But two countries stand out: Greece and Poland. In Greece, where Orthodoxy is the official state religion, just 18% of people think the government should give financial support to the Orthodox Church. And in Poland, only a minority (28%) say the Catholic Church should receive financial support from the government. Again, these attitudes vary considerably when comparing countries that have an official or preferred religion with countries that do not have this type of church-state relationship. Across the surveyed countries with an official or preferred religion, a median of 66% say being a member of the dominant faith (e.g., Orthodoxy in Greece, Catholicism in Poland) is very or somewhat important to truly belong to the nationality. In countries without an official or preferred religion, fewer people (a median of 43%) feel this way. On some other issues, publics in Eastern Europe have similar views regardless of their country’s church-state relationship. There is no clear difference, for example, on views about democracy. In countries with or without official or preferred religions, similar shares of people view democracy as preferable to any other kind of government (medians of 47% and 46%, respectively). Similarly, on the topic of pluralism, medians of 50% in both types of countries say it is better if society consists of people from different nationalities, religions and cultures (as opposed to a homogeneous society). In some ways, states that have an official or preferred religion tend to behave differently from states that do not. Not only are they more likely to provide financial or legal benefits to a single religion, but they also are more likely to place a high level of government restrictions on other religious groups. This relationship holds true even when controlling for the countries’ population size, level of democracy and levels of social hostilities involving religion (because government restrictions may be a response to social hostilities).39 Taking all of these factors into account, states with an official religion still score, on average, 1.8 points higher on the Government Restrictions Index than states with no official or preferred religion. Again, this relationship holds even when taking population size, democratic processes and social hostilities into account. In other words, countries with an official or preferred religion are more likely to enact bans on some religious groups than countries without an official or preferred religion – regardless of how large a country is, how democratic it is or how widespread social hostilities involving religion are within its borders. In Malaysia, for example, Islam is the official religion, and a 1996 fatwa required the country to follow Sunni Islam teachings in particular. Other Muslim sects, like Shiite, Ahmadiyya and Al-Arqam Muslims, are banned as deviant sects of Islam.42 These groups are not allowed to assemble, worship or speak freely about their faith.